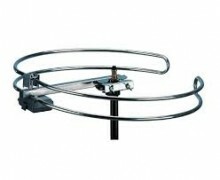 ALCAD FM102 COMPACT OMNIDIRECTIONAL FM ANTENNA (FM Radio ONLY). Treminated with F Connector type balun. Click the button below to add the ALCAD FM102 COMPACT OMNIDIRECTIONAL FM ANTENNA (FM Radio ONLY). to your wish list.